I have spent a blissful week in the sun, enjoying what Gran Canaria had to offer and the special moments shared with my family. 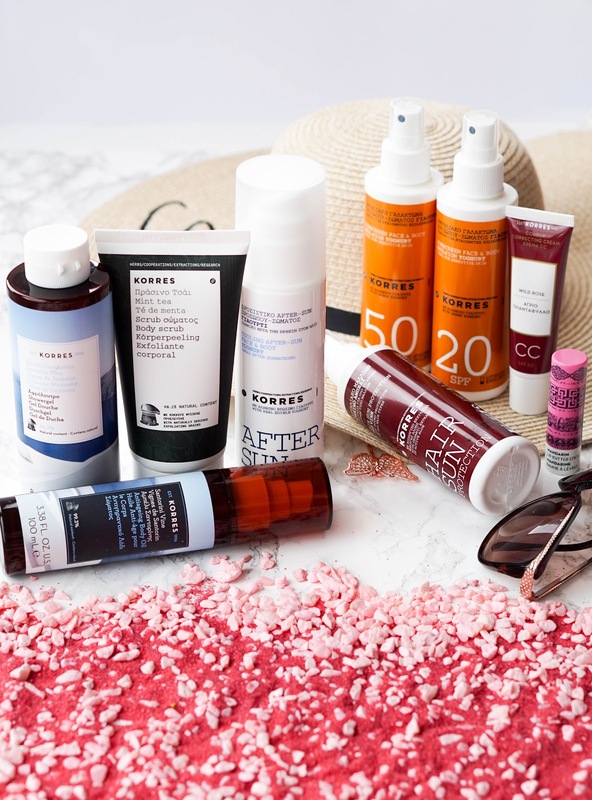 One thing I didn't have to worry about when planning for this trip away was my body care along with SPF, since Korres had my back. I received a lovely package a week before heading away, filled with everything I needed and more, from body scrub and shower gel to SPF lotion and lip balm. So I thought I would put together a post to tell you all about these products, how I prepped my skin for a week in the sun and my overall experience with the products whilst I was away. As I received the package a week before heading away, it gave me plenty of time to make sure my skin was exfoliated, moisturised and ready for a week in the sun. I usually exfoliate once a week, but since I was going away and I wanted my skin to feel it's best.. I made sure to exfoliate three times in the one week and I have to say my skin felt super soft and smooth. 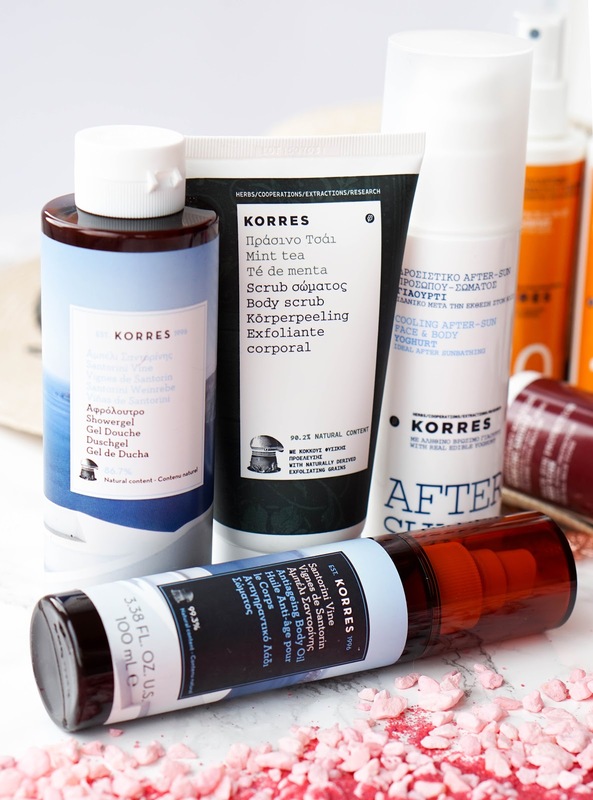 I used the Korres Mint Tea Body Scrub*, which never felt too harsh whether I used it on dry skin for a more intense exfoliation or whilst the shower was running. I absolute adore the fresh scent of mint, it's not too strong which I was a little bit worried a bit worried about. It's just very refreshing and an absolute pleasure to use. The scrub combines ground Bamboo with Jojoba beads, which help to effectively remove dead cells whilst also improving microcirculation. I love that this scrub doesn't contain things like mineral oil, petrolatum, silicones, parabens or animal by products. It also leaves my skin feeling somewhat hydrated with a smoother surface, ready to absorb something like a moisturiser or a body oil much better. The next duo that I used to prep my skin just in time for holiday mode was the shower gel and body oil from the brand's Santorini Vine range. Firstly the Santorini Vine Showergel* was a real pleasure to use, with a slightly sweet and fresh fragrance of the fruit Green wine grapes. 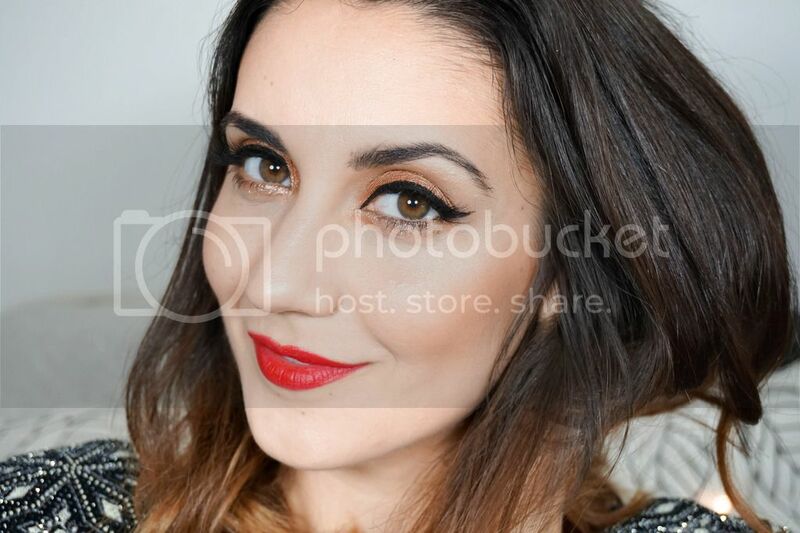 It has a rich texture, so a little bit goes a long way and it lathers up really well. It feels quite moisturising, so my skin never feels like it's been stripped of moisture even when I have exfoliated beforehand. Due to the wheat proteins, this shower gel helps to form a protective film on the skin so you can maintain hydration levels throughout the day. Lastly once I have exfoliated and washed, I will use the Santorini Vine Body Oil* to keep skin feeling nourished and I have continued to use this every night whilst on holidays. It helped my skin from flaking even when it was exposed to the sun all day and it just gave my body a healthy glow overall. I definitely enjoy using a dry oil like this on my body much more than a moisturiser, especially in the summer. It's so easy and simple, you just need to spritz on, massage and the oil will sink in immediately. 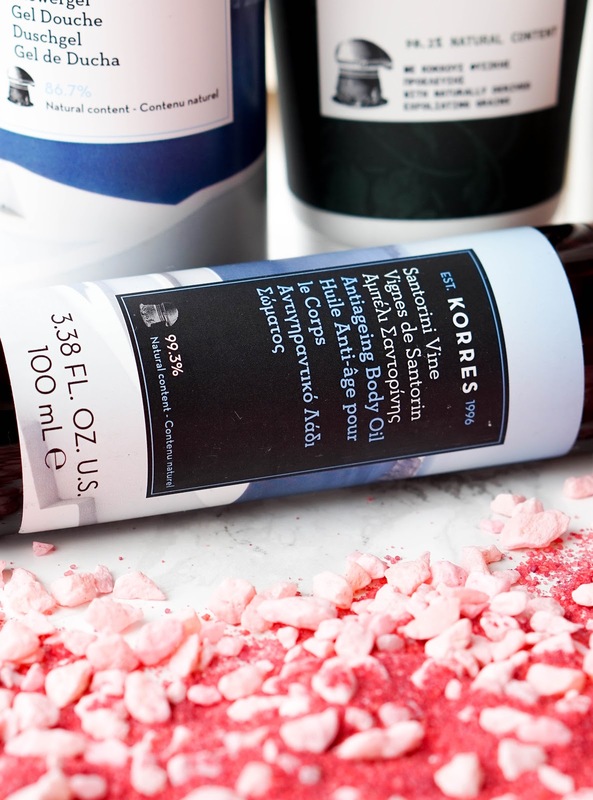 The scent again is stunning and one of my favourites from the Korres ranges that I have tried so far, not to mention that it's like summer in a bottle. The oil contains 99.3% natural oils of almond and apricot, which are not only ultra-nourishing but have anti-ageing benefits too. It's become a favourite and I will miss using it every night like I have been for the past week, but will be sure to keep using it in my weekly body care routine in the future. Next it's onto the suncare range that kept my skin from burning and offered a much needed protection from harmful sunrays. I was sent the Korres Yoghurt Sunscreen Face & Body Emulsion* in both SPF20 & SPF50. We started off the holidays using the SPF50 whilst our skin adjusted to the intense sunshine. To be honest I had my partner using this most of the holiday, as he is quite pale and prone to burning much easier than I am. After a couple of days we did start to mix it up with the SPF20 version, which still offered plenty of protection but also meant that we could get that sun kissed look to our skin. Both lotions are created using yoghurt as the key ingredient, since it's a natural source of lactose, proteins, minerals and vitamins. It also helps to soothe the skin whilst protecting it from UVA and UVB radiation. The sun screen is both paraben free and water and sweat resistant, which meant that I didn't have to re-apply constantly throughout the day.. only when it needed a top up. I liked the fresh fragrance and the fact that it didn't leave my skin feeling sticky or greasy, like some other sunscreens in the past. Because of the light texture and how quickly it absorbed into my skin, I was also able to happily use this on my face. Overall it definitely gets a thumbs up from me and my family. 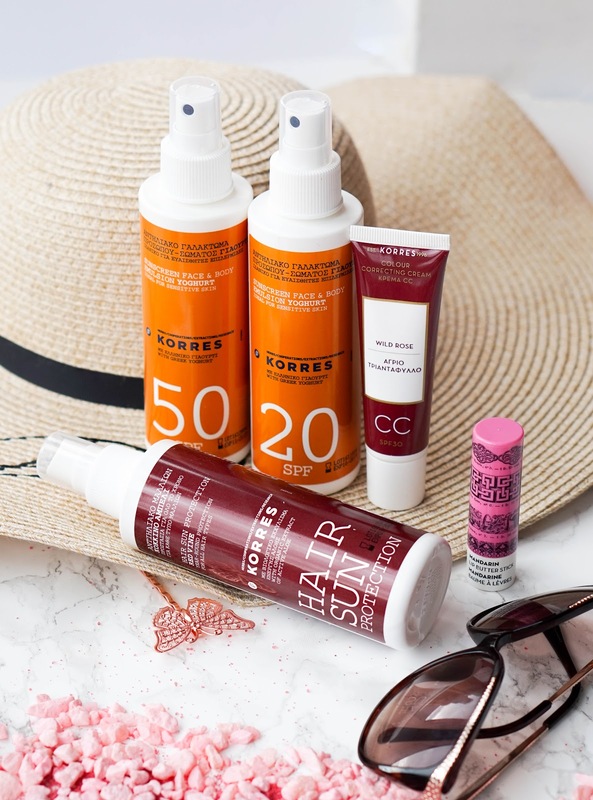 Next I have the Korres Red Vine Hair Sun Protection*, which is something that I've never actually used on a holiday before. Unlike my extensive skincare or beauty routine, my poor hair is always ignored and I rarely ever remember to give it some TLC. Since I do colour my hair and it tends to get brassy quite quickly, this hair sun protection was actually amazing for keeping the colour looking its best. The spray contains water-resistant UV filters along with sunflower extract, which help to prevent hair colour from fading away. Other ingredients such as aloe vera, protect the hair shaft, whilst provitamin B5 providing long-lasting hydration. I applied this on my dry hair every morning as I headed out for breakfast and by the time I was lounging around the pool, I couldn't even feel the product in my hair. It didn't leave an oily feeling and helped my hair from looking frizzy. Fantastic product and I can't believe I haven't used anything like it before. I'm always dealing with dry lips and on holidays it's no different, which is why I was delighted to see the Korres Mandarin Lip Butter Stick SPF15 shade Pink* I my package. I used this lip balm all throughout the day, to not only keep my lips soft and supple, but to add a wash of colour and some shine too. I've previously used the lip butter pots before which I did enjoy using, but I definitely prefer the stick version as it's so much easier to use whilst out and about, plus it's more hygienic too. Of course I also preferred the stick version as it contains SPF15 which makes it ideal for summer. 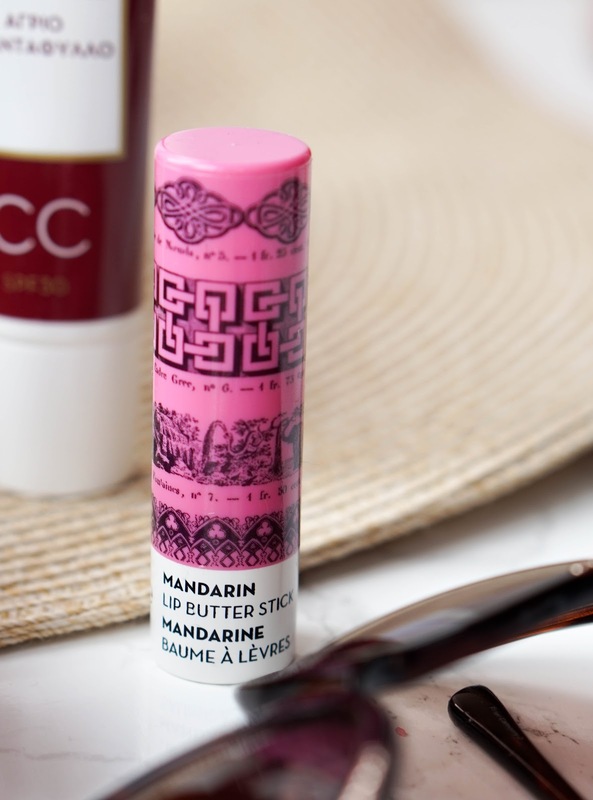 This lip butter contains fantastic ingredients such a mandarin oil, shea butter and sunflower wax to intensely hydrate and protect the lips. I wouldn't use this as my heavy duty night lip balm, as I don't find that it offers the much needed nourishment my dry lips need during the night, but for the day it's perfect. Lastly I have the Korres Yoghurt Cooling Gel*, which I didn't really need to use that much but my partner certainly got great use from it. This is a cooling and soothing gel formula, that leaves skin feeling refreshed and of course it provides comfort if your skin is feeling a little tender from the sun. The main ingredient is yoghurt, which is always recommended for sunburn, so it gives that much needed relief to skin that is looking red, along with helping to ease away the sensation of burning. It also contains which is an effective anti-inflammatory and anti-irritant, to protect the ski further. Even though I didn't get much use out of this, my partner can confirm that it felt extremely cooling after a full day in the sun ad it didn't leave his skin feeling greasy either. PS you may have seen the Korres Wild Rose CC Cream* in these photos also, but stupidly I actually forgot to pack this and bring it with me on holidays so of course I can't review it for you as I am yet to try it out. I have loved the Wild Rose skincare range in the past so I have high hopes for this. I hope you enjoyed my reading all about getting my skin summer ready and how I've protected it from the sun. 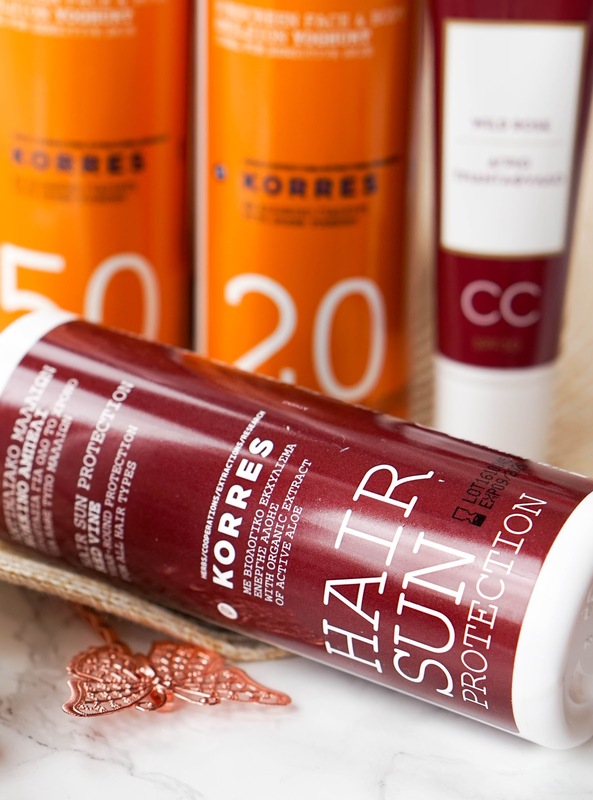 I would love to hear if you've tried any of the Korres suncare range? If not, you can tell me all about your SPF favourites..